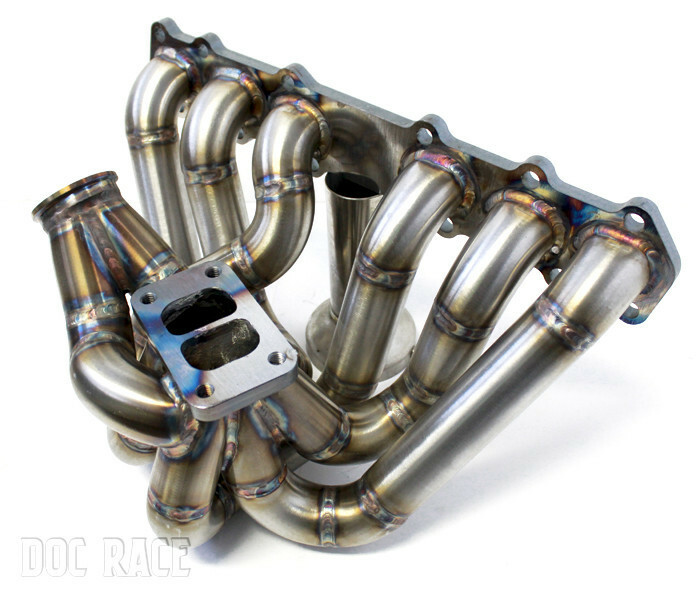 The DOC Race Topmount Turbo manifold is for the more extreme setup looking for the potential limit of the vehicles engine. 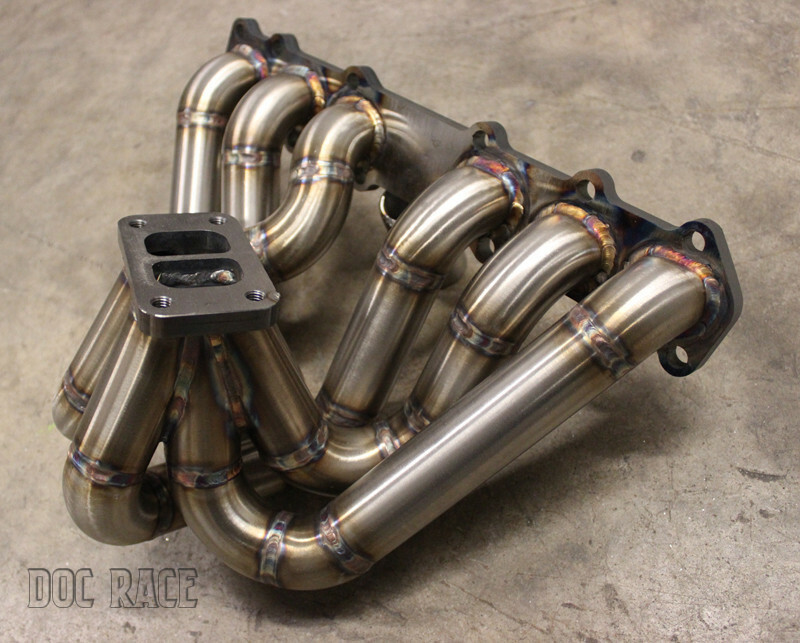 This manifold has seen well over 1000hp and is designed for peak-power situations. 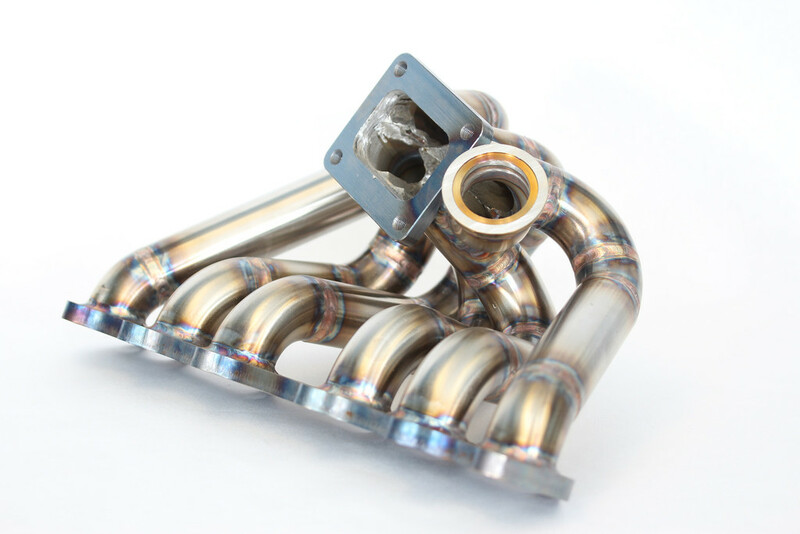 The DOC Topmount manifold can still be used for â€œstreetableâ€� vehicles, but is solely designed to make maximum horsepower and allow you to fit much larger frame turboâ€™s then traditional Bottom-mount Manifolds. D.O.C. still applies our elaborate porting process to complement maximum flow within ALL of our manifolds. The FP HTA™ GT3794R turbocharger is the next step beyond the FP HTA™ GT3586R in power production within the GT35R footprint. It combines the greater turbine flow found in the GT37 with the 90lb/min flow rating of the 94mm HTA™ compressor. The compressor wheel measures 67.5mm inducer and 94mm exducer. The turbine wheel measures 72.5mm inducer and 66.5mm exducer. This unit has a standard GT35R configuration, so it can easily replace an existing GT35R without modifying the header or manifold. It is available in T3 inlet with either 3" vband or 3" 4 bolt outlet, T4 Divided or TiAL Vband options. This turbocharger is recommended for applications running 40psi boost pressure that target the 800-900whp range. The FP HTA™ GT3794R has exceeded 900whp easily during testing as well has running 8's in the quarter mile with trap speeds in excess of 160mph. Welcome to the big leagues the FP 4205HTA™ is the largest turbo in our current HTA™ line up. If you're looking to make over 1000WHP this is the turbo for you. This turbo is not for the faint of heart it begins with a genuine Garrett GT42R cartridge and then gets the HTA™ treatment to turn it into the monster you see before you. The compressor on this bad boy is our proprietary 105HTA™ wheel rated at 115LBS a minute and measures in at 105MM Exducer and 76MM Inducer. Coupled with the monstrous GT42 turbine wheel this turbo can easily produce over 1200WHP on a well setup car. Welcome to the big leagues the FP 4294HTA™ is the 2nd largest turbo in our current HTA™ line up. If you're looking to make over 900WHP this is the turbo for you. This turbo is not for the faint of heart it begins with a genuine Garrett GT42R cartridge and then gets the HTA™ treatment to turn it into the monster you see before you. The compressor on this bad boy is our proprietary 94HTA™ wheel rated at 90LBS a minute and measures in at 94MM Exducer and 67.7MM Inducer. Coupled with the monstrous GT42 turbine wheel this turbo can easily produce over 900WHP on a well setup car. This is a Dual Ball Bearing GT2854R Turbo with internal wastegate foe quick easy installation and setup. The turbine housing is a .64 AR with 5 bolt style outlet. Super quick response for 4 cylinder engines. This turbo is ideal for smaller displacement engine making up to 270 hp.